7 Buckingham Street is a newly renovated terrace house in the desirable Bishophill area of the city. There is no through traffic which ensures the street enjoys a quiet residential feel. However, being within the walls, all that York has to offer is only a short stroll away making this the ideal location from which to explore the city. We enjoyed our stay - cosy cottage in a great location. Everything was very clean and we liked the good quality towels and bed linen. Comfortable beds too! We would have appreciated a coffee machine or a cafetière and a few more mugs , but overall it was a good choice and we would be happy to recommend. Booking was easy, good communication about time of arrival key safe etc. Small but perfect accomodation for two couples. Little extras tea, coffee milk salt and pepper sauces etc. 5 mins walk across the bridge to the centre of York town centre. Quiet side road with permit parking, permits provided on.arrival. Would highly recommend. The property is small but lovely, and well kept. Its minutes walk from from the town, which is very handy for shopping. However the downside is on weekends with the windows open, the revellers reterning home after a night out was too noisy for me, and ofter woke my up. A pleasant stay in a pleasant house in York. We enjoyed our time at 7 Buckingham, and thank you for the opportunity to stay there. The location is wonderful for walking around York. The accommodations are good. The stairs were a bit difficult for four 70 year olds - kept telling each other it was good exercise. And, being old, the one suggestion we came up with would be grab bars in the bath to help getting in and out of the tub. Thank you again for your part in a wonderful week! Very comfortable accommodation in great location. Very comfortable accommodation in a great location. Quiet area, even though it is only a short walk to the centre. Had everything you need for a short break. 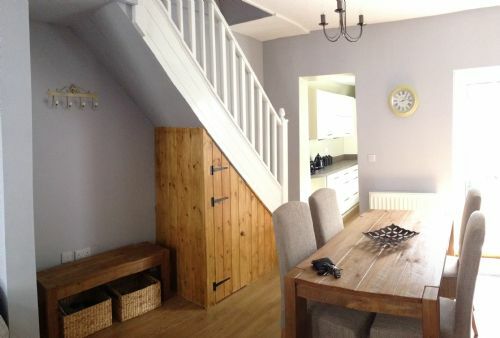 Charming cottage right in the centre of York. Lovely compact cottage with all necessary comforts. Excellent location and quiet too for being so close to the city. Garden is a small courtyard so don't be fooled into thinking it will be a place for children to let off steam; though there is a playground nearby. This property does not have a key safe and is a meet and greet arrangement- discovered after starting the booking process, with an arrival window of 14:00-16:30 or a 'late arrival fee' is payable (of £10). We found this quite restrictive and stressful, travelling a long way with children during peak season. Could be solved with a key safe with little detriment to the arrival process as working out what does what was easy enough in this property. We loved our stay at 7 Buckingham Street. 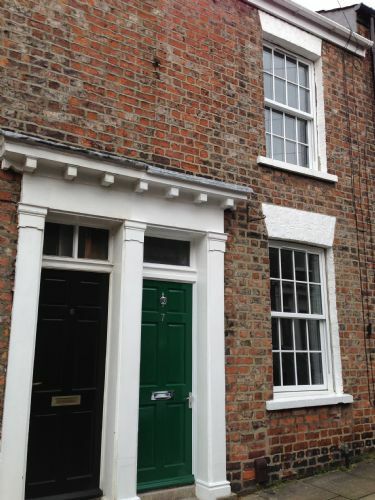 The property is charming and well placed in the centre of York. We didn't have to wait when we arrived at the property to collect the keys, and returning them was a doddle. It was sparkling clean and every interaction with In York holidays was a pleasure - very friendly and professional. Highly recommended! The recent floods (and indeed any floods) did not reach 7 Buckingham Street. The property therefore remained in pristine condition. The location is is so fantastic - within the city walls, yet so close to all amenities, cafes, restaurants and attractions. No sign of any recent problems - Well done York!!!! and Well done 7, Buckingham Street!!!! Gemütlich, sauber, zentral und doch sehr ruhig. We are a family of four. Kids 9 and 12. We had a wonderful time and the accomodation was wonderful. Clean, cosy (it was winter), convenient, and with modern amenities. Can't fault it. Such a great find ,everything pristine . 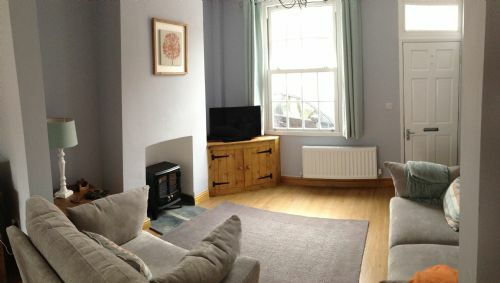 Great location ,as walking into town only takes five minutes where you can shop , eat , walk round the wall of the town and added to that you can leave your car parked just outside your front door. Great property and excellent location being only a short walk from the centre of York. 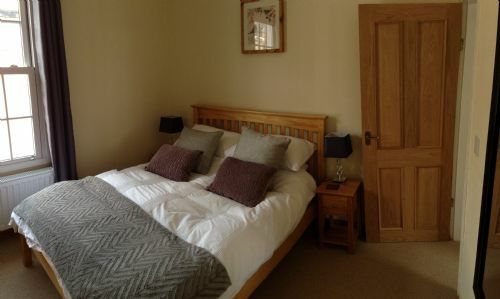 The property has been renovated to an extremely high standard and was very comfortable. Only downside from our point of view, having bad knees, was that the bathroom was downstairs and didn't have a walk-in shower. The stairs are quite steep so would probably recommend a stairgate be fitted at the bedroom door for when children are staying. Having said that we thoroughly enjoyed our stay and would recommend the property to family and friends. Having decided at the last minute to spend a few days in York, we set about looking for somewhere to stay. With two teenagers in tow, family rooms in hotels are really only manageable for overnight stays so we were looking for somewhere with a bit more space. We were delighted to find that 7 Buckingham Street was available for the dates we wanted as it appeared to be everything we were looking for. As usual with anything booked over the internet, we were a little bit apprehensive on the journey! We needn't have worried as we were met at the property by the representative from In York and our minds were soon put at ease. The property itself is immaculately presented and spotlessly clean. The owners have added lots of little touches to make your stay just that extra bit special and comfortable. The location is superb - everything in the city is within a 10/15 minute easy walk - we parked the car on our arrival and did not need it again until we left. We would definitely stay here again. The house is delightful. The only difficulty for us, being in our 70s, was the very steep stairs up to the bedrooms and the bathroom being on the ground floor. But saying this and understanding with the age of this lovely terraced house we enjoyed our 11 comfortable days. 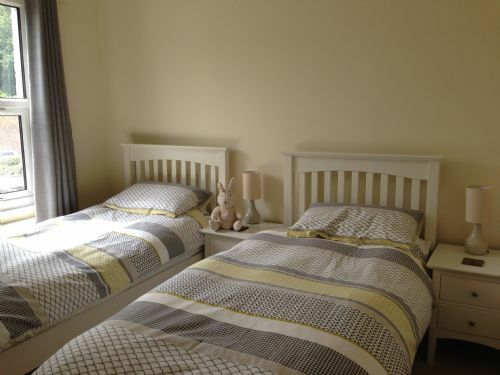 Attractively furnished house in good location for visiting York. I would happily recommend it and would book again. A few minor niggles. We did not eat out every day and I would have liked the kitchen to have had more everyday items for cooking with. Also I would have liked provision for drying laundry outside instead of having to use the dryer. Overall we throughly enjoyed our stay. A great little property in an excellent location only 3 to 5 mins walk to the heart of the city. Convient sainsbury's store close by and on the walk home from the city. Close access to the river and parks for the kids. No on site parking but there was always plenty on street parking available and for 90% of the time I found a car park on the front door step. Beautifully finished and furnished property. Highly recommended. Have just returned from 5 days at this property, my family and I were absolutely delighted. It is less than five minutes from the centre of York with all it's attractions and restaurants and there is a Sainsbury local 2 minutes away for necessities. Good quality linen and comfortable beds. Although we made use of the restaurants the kitchen appliances are of good quality too. Would definitely recommend this property for a family with older children - the stairs are steep but we were advised if this on booking. Our stay was perfect. The apartment is centrally located yet away from the hustle and bustle allowing for good rest at the end of a day spent exploring. 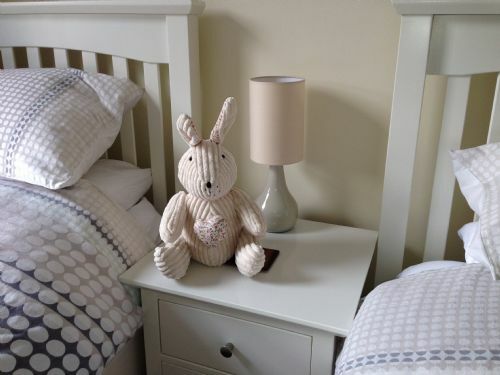 It is beautifully decorated, cosy and comfortable with everything needed and was the perfect size for our family of four. We loved the apartment and York so much we extended our stay. The team at In York were great to deal with. The home was very clean and conveniently located to the city center on a low traffic and fairly quiet street. There were some restrictions on the wifi access which prevented us from accessing our social media at first but the owners promptly corrected the situation when notified. Lovely property, very clean, new and modern. Beautiful quilts ,bedding and towels. Very central. Walked in and out of york several times a day. If i was to find any critisism at all it would be for a mirror in the second bedroom. 4 girls stuggled to share! Also a second parking pemit please as i had to park our second car 1/2 mile out of town. Big thankyou to richard whk gave us a lovely yorkshire welcome. Thanks for the milk and wine and coffee ect ,much appreciated. Would definately use again . Josie from hertfordshire. Everything about this let was wonderful. For a family of four, it was just the right size. All the amenities that we needed had been provided and for our own use there was a Sainsbury within a minute's walk. The location is ideal for all the major sites. The only reason I have not given this a 5 for cleanliness is that the towels supplied were black. I think the reason why all hotels use white is to reassure guests that they really are clean! I am sure these were as well, but white's best I think. Great property and location. Close to all amenities and yet in a quiet location. Fantastic place great location nice meet and greet ,Free bottle of wine and christmas tree still up what more could we ask for regards Kevin Cheeseman . A wonderful property in a superb location just 2 minute walk from the centre of town. The house was spotlessly clean and so comfortable. We had a brilliant time, wouldn't hesitate to recommend it. This was our second visit and it won't be our last! So quiet and comfortable - difficult to add anything to our previous review. Everything has been thought of, even the welcome bottle of wine and the chocolates were first class. We were moved to this house following a poor experience at the flat we had originally booked. The agents,, In York Holidays, went above and beyond the call of their duty in doing so as our original contract was with the owner rather than with them. The house is a recently renovated terraced property conveniently close to the city though in a very quiet side street. On street parking with permit. 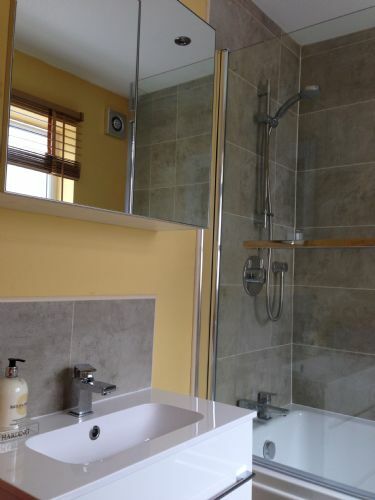 Decoration to very high standard with good quality kitchen and bathroom fittings and soft furnishings. Of particular note is the flame effect fire which gives a cosy warm feel to the lounge. Galley kitchen with bathroom beyond. Small yard to side / rear. The location of the apartment was great. The apartment itself was very nice and clean. Only the booking over the angency was a bit complicatet. The property is beautifully decorated and comfortable. Everything you could want has been thought about and provided. 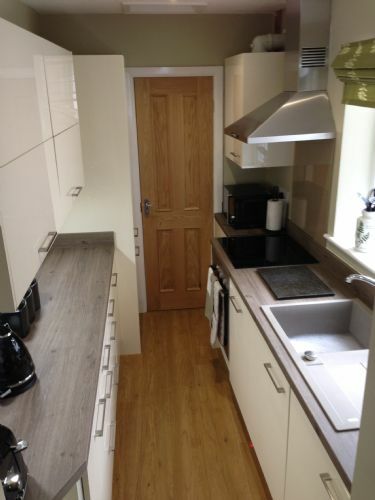 The kitchen and bathroom contain all modern equipment and are spotless. Within the city walls, the property is less than five minutes from all the historical attractions, shopping etc.yet is close to picturesque walks and cycleways along both banks of the river and in both directions.